Gents, Troy is working on a firewall report and needs some assistance. He's found that Norwood cars follow the AIM exactly for the firewall piercings, but he's found that LA didn't always go by the book! Specifically, the manual transmission backup light wiring hole and the oil line hole for the U17 gauge option. Therefore, anyone with an ORIGINAL UNRESTORED Los Angeles built 67 or 68 Camaro with a manual transmission (3 or 4 speed), please post a picture of your firewall. 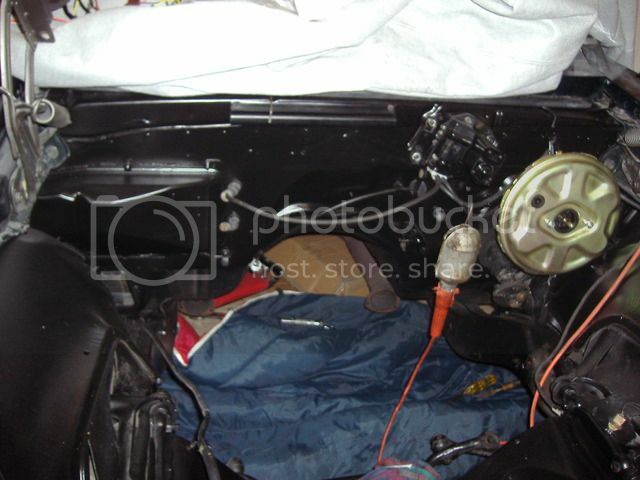 Specifically the general area where the backup light wiring hole is, but a large enough picture so he can get a reference as to other holes and components. Also, anyone with a Los Angeles built 67 or 68 Camaro with the U17 gauge package (manual or automatic transmission), please post pictures of your firewall. Again, specifically the general area where the oil line goes through the firewall, but a large enough picture so he can get a reference as to other holes and components. In addition, please post the year, model (Coupe or Convertible), and build date of your car, along with the Fisher Body scheduling code, so he knows when any changes that may show up took place. Any questions, or if your picture is too large to post on site, feel free to email them directly to Troy or myself. My email address is in my profile. Since this is for LOS cars, might be useful to include the Fisher Body scheduling code from the trim tag, in addition to the year and body build date code. I'm hoping to pull my engine in a few weeks and will get a good shot of the hole for the oil pressure line at that time. My old red '67 Z that I tore apart back around 1989. E31 code on the tag and 05A build week. Sorry for the bad pictures but the average camera in the old days was not like what we have today. This was a console/gauges car. Here is my 05C 67 L78 los car with gauges. My backup light hole appears to be closer to the tunnel than the small blocks above. I will have to check the oil line hole. just above the gas pedal linkage and has a rubber grommet. The L78 has a brass fitting at the firewall. The second picture of the 67 with the oil line is sure interesting. It has the rubber grommet. There has been a thread going around last year and it touched on when the switchover was from the metal firewall union to the rubber grommet ( http://www.camaros.org/forum/index.php?topic=9493.0 ). The assembly manual shows around April-May 67. My 05B NOR has the rubber grommet. I'm surprised to see your 02C car has it. What is the "13" in the tunnel in the second picture? In both 67 norwood cars I have the brass fitting in both 03B 350/295 auto, 03C 396/325 auto. In the 2 Los cars: 02C 396/325 auto rubber grommet, 05C 396/375 4 spd rubber grommet. I will add this and pics to the other thread. Oh the 13 is stamped on top of the t400 transmission. Kind of hard to see in this photo but the back up light grommet is above the trouble light. 05D LOS Z. Here is a 1968 12D LOS Z28 w/ Gages. Notice the gage line stuck thru the grommet for the M21 spedo cable hole.